In the year prior to the Scottish independence referendum, the Jimmy Reid Foundation instigated a project that became the Common Weal think tank. Its plan was to devise a manifesto for a fairer, more democratic, independent Scotland in the twenty-first century. Published in June 2014 under the editorship of Robin McAlpine, former researcher for the Labour MP, now peer, George Robertson, All Of Us First argued that the British State was fundamentally undemocratic, merely an engine for neo-liberal economics, and essentially unreformable: ‘Britain is designed for profit maximisation’ yet wealth belongs only to the few; according to Common Weal, there is ‘No wealth but life – how did we forget this in Me-First Britain?’1 In the days after the referendum, however, it became clear that those who had voted No had done so based mostly on the perceived economic risks of independence and that this was one of the key deciding factors in Scotland remaining part of the United Kingdom.2 John the Commonweal, the everyman hero of Sir David Lindsay’s Satire of the Three Estates, who speaks truth to power in the name of the good of the whole community, the true common wealth, had been silenced by economic individualism and the realpolitikal machinations of Project Fear. The memory of the common weal, with its roots in an older, pre-Union Scotland, had, it seemed, been forgotten. Scotland, home of Adam Smith and the birthplace of capitalism, remained British. Cairns Craig’s The Wealth of the Nation cuts directly against assumptions of economic primacy and the fear of capital flight after independence. His argument that ‘the accumulation of capital is not as important to the nation as the accumulation of cultural capital’ (p. 291) will raise the eyebrows of even the least canny of Scots, and surely speaks loudest to a constituency of middle-class cultural nationalism that would never, on its own, be big enough to actually secure political independence. Darren McGarvey’s reminder that class positionality breeds divergent perceptions of cultural value – his example: the mainly middle-class grief at the devastation by fire of the Glasgow School of Art – is salutary: culture, and its associated capital, remains largely the preserve of an educated elite.3 Craig’s book is not concerned with the invisibility of class in the prestige cultural economy, however, but with the invisibility of culture in most historical accounts of Scotland and the negative effect Craig believes this has had on the national self-image. The Wealth of the Nation is chiefly concerned with the uses and abuses of Scottish history and historiography, and its aim, from a contemporary nationalist perspective, is to rediscover a useful Scottish past. Revivalism is at the heart of Scotland’s relationship with its own history, and has been the means through which the nation has survived as a distinct cultural entity since 1707. If, for instance, Macpherson’s Ossian mourns the loss of the Gaelic past, then that past is revived through its very memorialisation in Macpherson’s poetry. From revivalism emerges the historical novel, Scott’s means of rescuing the past from potential historical oblivion. Scotland and her capital city had, by 1814 and the publication of Waverley, become a ‘memory machine for the recollection of the nation’s past’ (p. 33), just as Scottish culture has allowed the rest of the world to nostalgically remember an imaginary past of romantic and communal ideals that has been destroyed by linear history – a linear history that bids us look backward as it marches us implacably into the future. This leads Craig in certain fascinating directions: the idea, for instance, that the Scottish Enlightenment happened not in the eighteenth but the nineteenth century, emerging as a result of the migratory world diffusion of the Scots and their philosophical traditions. The conventional historical equation – that Union with England produced the Scottish Enlightenment and that Enlightenment was the philosophical basis for the British Empire – is turned on its head, with Craig arguing instead that the Scottish empire of the nineteenth century arose from a ‘projective nationalism’ (p. 39), one that retrospectively constructed an historical Scottish Enlightenment of the previous century. Emigration was not a sign of Scottish decline, as normally assumed, but a mark of the nation’s vigour through the universalisation of Scottish talent. What Craig doesn’t say is that the notion of a Scottish empire weakens the present-day Unionist argument that Scotland is ‘too wee, too poor, too stupid’ to be independent, as well as demolishing nationalist contentions of colonial oppression from the Saor Alba brigade. Craig’s bid to challenge some of the more stubbornly negative appraisals of Scotland’s past is, on the whole, immensely valuable, but it does lead him on occasion into questionable territory. Most notably, when addressing Enlightenment racism and its nineteenth-century legacies, Craig decides that the racial theories defined in Robert Knox’s The Races of Men (1850) or manifested in Scott’s Ivanhoe were ultimately ways ‘in which Scotland resisted the tyranny of “history” as the only relevant category within which human experience could be understood’ (p. 136). The stadial history that Craig believes such racial theories to be resisting was, however, a product of the Scottish Enlightenment, and those racial theories served to buttress the ongoing Enlightenment universalism behind British imperialism. Understood as such, a Scottish empire has a less benign tenor than the one marked out in Craig’s book. When that empire began to decline in the early twentieth century with the retreat of the British Empire, this undermined the political Union and set off the cultural revival known as the ‘Scottish Renaissance’. While he fleetingly acknowledges the achievements of particular writers, such as Nan Shepherd and Neil Gunn, Craig sees the renaissance more generally as a nostophobic movement in denial of Scotland’s post-Union past, specifically the nineteenth century that he wishes to rehabilitate. Edwin Muir’s estimation of Scott and Burns in ‘Scotland 1941’ as ‘sham bards of a sham nation’ and Hugh MacDiarmid’s dismissal of Scottish popular culture in A Drunk Man Looks at the Thistle and various prose polemics indicate for Craig not nostalgic homesickness but a sickness of home that was to define the mood of Scottish intellectuals until after the 1979 devolution referendum. However, Craig’s description of the renaissance as ‘the gravedigger of the Scottish past’ (p. 181) not only problematises the early twentieth century period in like manner to the negativity he ascribes to Muir and MacDiarmid, it misses the more pervasive pessimism of modernism – Eliot’s poem was not called The Waste Land for nothing – and the extent to which the cultural revival spawned modern Scottish nationalism. This last point is ironic as The Wealth of the Nation not only argues that cultural capital is more significant than mere economic wealth, but that in Scotland since 1979 cultural revival has preceded the political change that has led to devolution. That culture stands in for politics in an unrepresentative political system is an idea with postcolonial leanings, which sits oddly beside the tribute paid here to a Scottish empire. It also leads Craig to make unsustainable political appropriations, such as describing the so-called second cultural renaissance in the 1980s as fundamentally nationalist when many of the writers and artists of the time had arguably more socialist political affiliations. And this begs the question as to whether culture must always serve national – or, indeed, any – political ends, followed by several other related questions, such as: Is Scottish Literature as a specialist subject area only valid with a politically nationalist aim? What if in Scotland the political never ‘catches up’ with the cultural? And if ‘without cultural independence a country ceases to exist’ (p. 291), as Craig assures us, does any country have genuine autonomy in a now largely culturally inter-related world? Following the rejection of Scottish independence in 2014, The Wealth of the Nation cannot wholeheartedly make the cultural argument for self-determination; the book’s claim is both more modest and more remarkable: that Scotland, whatever its political state, has remained a distinct nation because of its cultural wealth. However, as Britain lurches unpreparedly towards Brexit, dragging an unwilling Scotland along with it, any talk of a future independent Scotland is likely to remain fixed firmly on the economic wealth, or otherwise, of the nation. 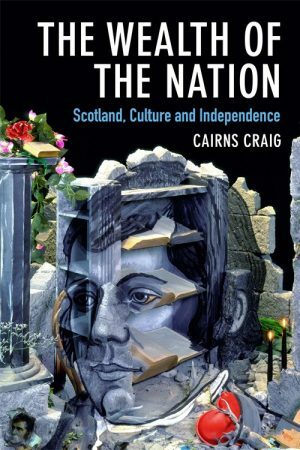 The Wealth of the Nation: Scotland, Culture and Independence by Cairns Craig is published by Edinburgh University Press, 2018. Common Weal, All Of Us First (Glasgow: Scottish Left Review Press, 2014), p. 117. See Lord Ashcroft poll, The Guardian, 20 September 2014. [last accessed 25 September 2018]. See Darren McGarvey, Poverty Safari (Edinburgh: Luath Press, 2017), pp. 144–5. Cairns Craig, Out of History: Narrative Paradigms in Scottish and British Culture (Edinburgh: Polygon, 1996). Michael Fry, The Scottish Empire (Edinburgh: Birlinn and Tuckwell Press, 2001). Scott Lyall, Lecturer in Modern Literature at Edinburgh Napier University, is author of Hugh MacDiarmid’s Poetry and Politics of Place and editor of volumes on MacDiarmid, Lewis Grassic Gibbon, and Community in Modern Scottish Literature.